Air pressure washer, also known as pneumatic power washer, got it's name because these pressure pumps are powered by the air. So instead of using fuel or electricity to power the engine of the pressure pump to create pressurized water, these pumps use air. Economical: Since the pneumatic power washer does not use any fuel or electricity and is completely air-powered, it is highly economical. Environment Friendly: Gas powered machines often release harmful gases into the atmosphere. This makes air powered pressure washers completely environment friendly. Easy to Use: These pressure washers are extremely easy to use. The controls are just like any pressure washer and it comes with a manual, too. Reach: Air pressure washer is completely safe to use in places where electric or gas powered pressure washers can not be used. Examples of such places are nuclear plants, pharmaceuticals and refineries. Lightweight: this machine may be carrying out a big task, but it neither huge in size nor heavy. Easily carry it out from one place or another without have to worry about transportation. It will fit right in any car. Stainless Steel Wand: The wand attached to the pneumatic pressure washer is made of stainless steel. This means that it is corrosion and rust resistant. The option of dual wands is available. Spray Nozzles: There are multiple options available in the spray nozzles. The nozzle is easily detachable and the one suitable for the task at hand can be attached. 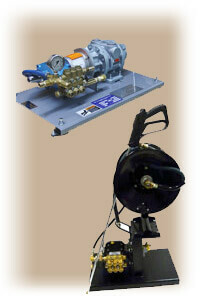 Dual Lances: This option is available for those who need two different pressures for the cleaning process. Hose Reel: The pressure hose can be of a length up to 50 feet. The pressure hose is braided with steel to reinforce it to bear high pressures. Maximum Pressure: The air pressure washer can provide very high pressures, just like an electric pressure washer. Weight: One pneumatic power washer will probably not weigh more than 30 kg when it is dry. Cold Water: These pressure washers use cold water for cleaning purposes. There are pressure washers that use a heating coil to convert cold water into hot water. But not all air pressure washers have this feature. Pneumatic power washers have to be maintained just like the normal power washers. The most important thing to clean and maintain is the power washer spray nozzles. These nozzles are shaped in different angles for the different purposes that they are used for. Make sure that after use you check the nozzle for any clogs. Gives you extra height without needing a ladder! Make the right decision, when it comes to your pressure washing needs.